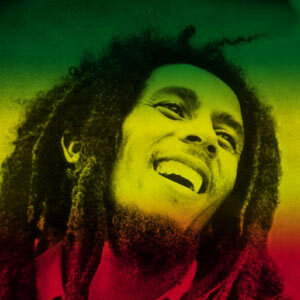 February 6, 1945 Robert Nesta “Bob” Marley, singer and songwriter, was born in Saint Ann Parish, Jamaica. The Wailers disbanded in 1974, although Marley continued to record as Bob Marley & The Wailers. In 1975, he released the “Natty Dread” album which contained the international hit “No Woman, No Cry.” This was followed the next year by “Rastaman Vibration.” From 1976 to 1978, Marley lived in England where he recorded the albums “Exodus” (1977) and “Kaya” (1978). Other albums by Marley include “Babylon by Bus” (1978), “Survival” (1979), and “Uprising” (1980). Marley died May 11, 1981 and was posthumously inducted into the Rock and Roll Hall of Fame in 1994 and awarded the Grammy Lifetime Achievement Award in 2001. In 1999, Time magazine named his album “Exodus” the greatest album of the 20th century. A number of books have been written about Marley, including “No Woman No Cry: My Life with Bob Marley” (2004), “Catch a Fire: The Life of Bob Marley” (2006), and “Before the Legend: The Rise of Bob Marley” (2007).